It takes an investment to make change. I know that. I experienced that on many occasions. I think that at this moment and time I would just prefer a magic bean or fairy godmother. I intend to be completely honest with you – not that I keep anything from you but more that I have yet to want to expose this particular journey to the light of day. We think that if we keep the light away then nobody will know. Most of the time, everyone that sees us knows – or suspects. Better to go ahead and rip off the veil and expose it to the light so that I can start to heal. I have mentioned before that my weight was an issue from the time that I was a teenager (and discovered, from the words of another that my weight was an issue). My mom was a beautiy queen with a waist that would make Scarlett proud when she was in school. The women on her side of the family talked about weight probably more than they realized. I heard and I accepted. My body is not like the other women in my family. I am shorter and more – shall we say, voluptuous. I have a different muscle structure than they do. But still, I wanted to fit into the same mold as all of them – because that is what we are supposed to do, right? I followed all the fad diets and kept a strict record of my weight. I still remember that chart – and how at 14 years old, 5 ft tall, I weighed 119 pounds and was considered overweight. And so I continued to struggle. I got into the best shape of my life in college, partly because I ran out of money one month and lived off Cream of Wheat but mostly because I was teaching ballroom dancing and on my feet (in high heels) dancing for up to ten hours each week day. I was able to invest the time necessary to stretch and dance, and that sculpted my body like never before. I still needed to lose weight. “You are fat and will never be a professional ballroom dancer.” We had a coach in to work with us for an upcoming competition and those were his words to me. At 21 years old and (still) 5 ft tall, I weighed 135. My muscles were tone, and I had more flexibility that ever in my life. But I was still considered overweight. I married my first love, and he supported me in all that I did (and all that I do). He never told me that my pants were too tight. He never said I might need to do a few more crunches. He just loved me. I did manage to lose most of the baby weight from the first two children, but the weight from the third one has been determined to hang around (and bring friends). Lately, I have watched friends share their posts about miraculous weight loss because of this or that. I have been tempted. I no longer have 10 hours a day to dance (plus the two hours for stretching). I cook. I clean. I garden. I write. I mother. I wife. But (and this is where I confess the truth) at 44 years old and (still) 5 ft tall, I weight the most I have ever weight at 205 lbs and I KNOW that that is overweight. My husband tells me I am beautiful and it makes me feel better. But I see the images in the pictures and I know that it is not healthy. If I am not willing to invest the time to get smaller and healthier then maybe the pill or drink or procedure is in order. And so I continued to struggle . . . until this 30 Day Family Challenge. I invested just a few minutes each day tackling different projects. Sometimes it was reading and sometimes it was cleaning, but always it was just a little time (no more than an hour). I look at our family picture from 30 days back and I look at my picture from this morning – and I see change the scale does not reflect. So, maybe it is time I quit comparing myself with others and keep to my own image. I am not like my family. I will never be my mother. I am different from those friends sharing on social media. Today starts a new challenge and this one will be more focused on my health than the last one. My older sons are off to camp to work for the summer so I have a little extra time to invest in my health and I fully intend to make it happen – a little bit at a time. Not so much the weight, although I know that the weight will fall as the health increases, but more the endurance, strength and flexibility. 1. Eat something fresh, first, at every meal. 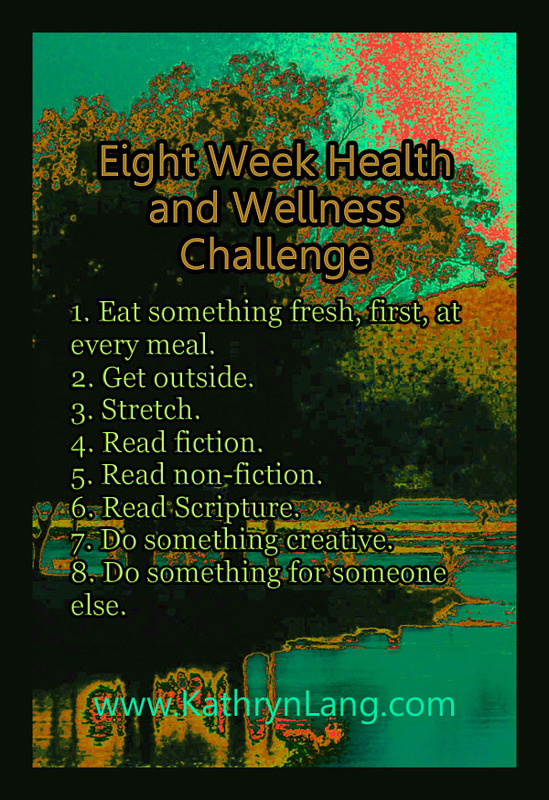 Eight things for eight weeks – are you up for the challenge? Remember, your eight things do not have to be my eight things because we are each unique in this journey. Share your own challenges below. Yea! I finished another fiction book – that makes three for me this summer. I’m almost done with “The Freaks Shall Inherit the Earth.” So I guess I need to get my next non-fiction geared up and ready. 🙂 What are you reading? Just finished The Supreme Macaroni Company by Adriana Trigiani. And she made me cry! An unexpected ending.